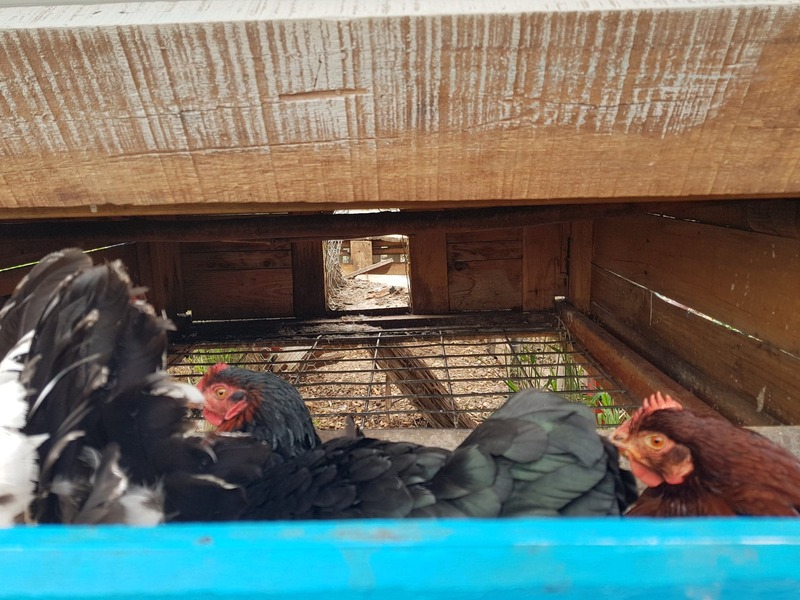 If you’re about to build yourself a chook house, we highly recommend a self-cleaning version where there’s no build up of poo at all inside the house. 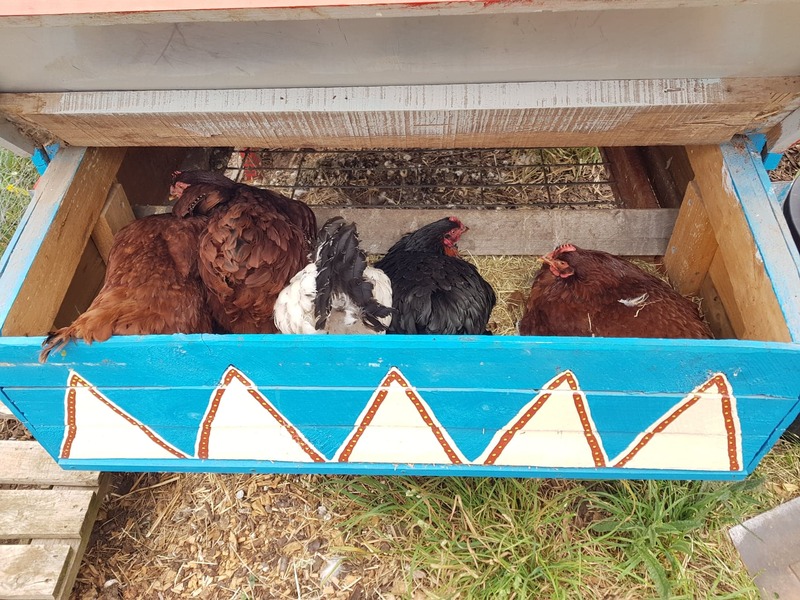 As well as saving yourself time, this creates a healthy environment for your chooks. 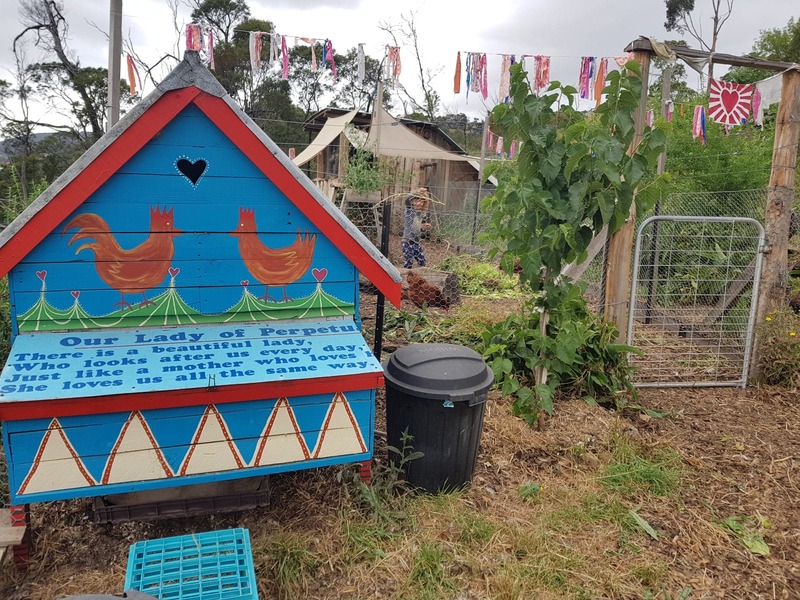 We built our chook house from salvaged pallets over 4 years ago and it’s still perfect. Since then we bought the neighbouring patch of land and have shifted the chooks and their house to flat ground and given them more space. It works *so* well. The floor is made from strong wire mesh, allowing all poo to fall straight through to the ground beneath. Sketch showing a profile of the chook house. This particular drawing is for a client’s garden, not ours. Peak hour in the nesting box! 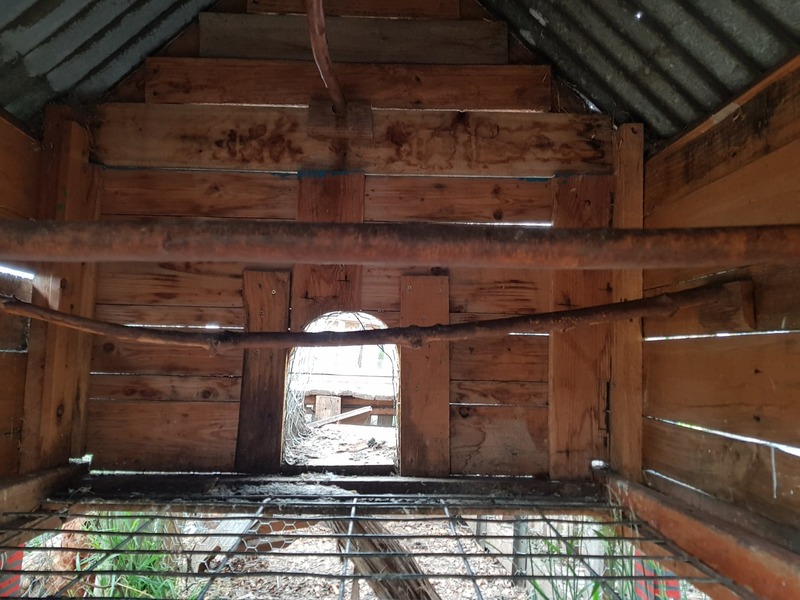 The inside of the chook has includes a number of branches (roosts) that the chooks sleep on and drop enormous amounts of poo from. 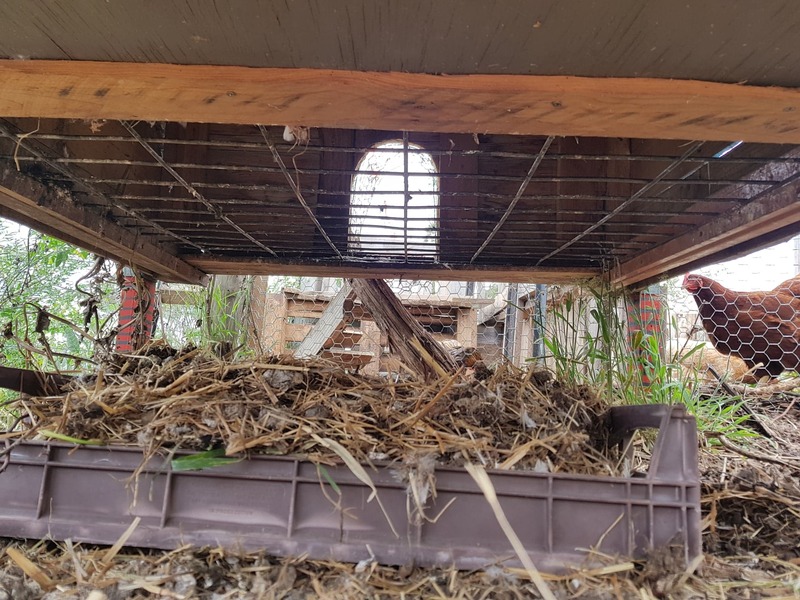 Under the chook house we’ve placed a “poo catcher” (we use an old bread crate found on the side of the road). This catches some of the poo and makes it nice and easy for you to simply drag it out with one quick motion. 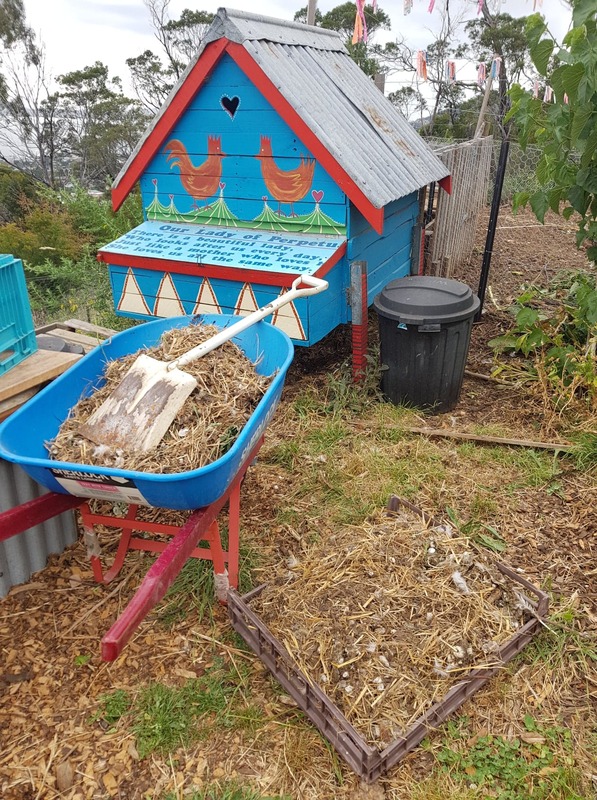 But of course, the chooks poo everywhere and we still end up scraping out a decent amount into a wheelbarrow, as well as what falls into the bread crate. So technically, you *do* still need to participate in the cleaning process – but you don’t have to get into small spaces and scrape poo off timber. It’s approximately one million times better this way. 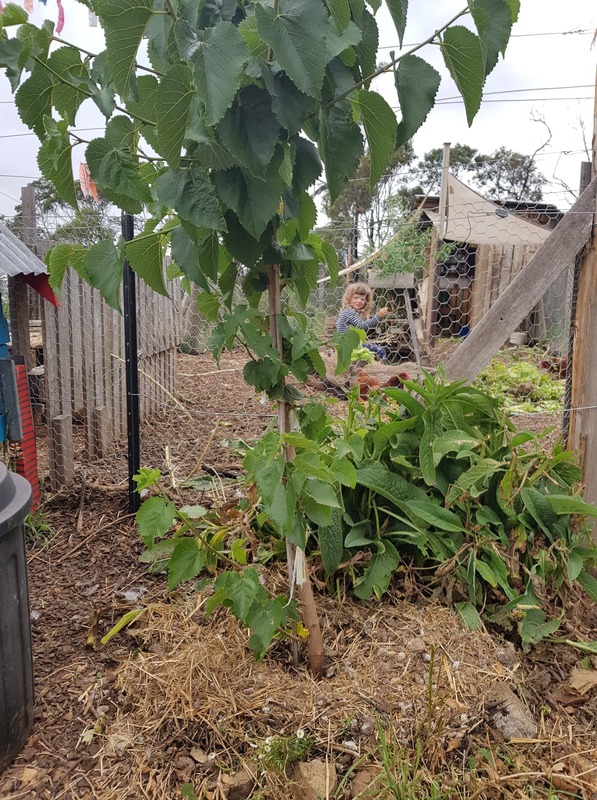 As there’s a nice mix of dry straw and chook poo (mostly dry and old), I then put it straight onto one of our many fruit and nut trees. Today the mulberry and hazelnut trees got it. A happy mulberry tree (and Frida in the background). 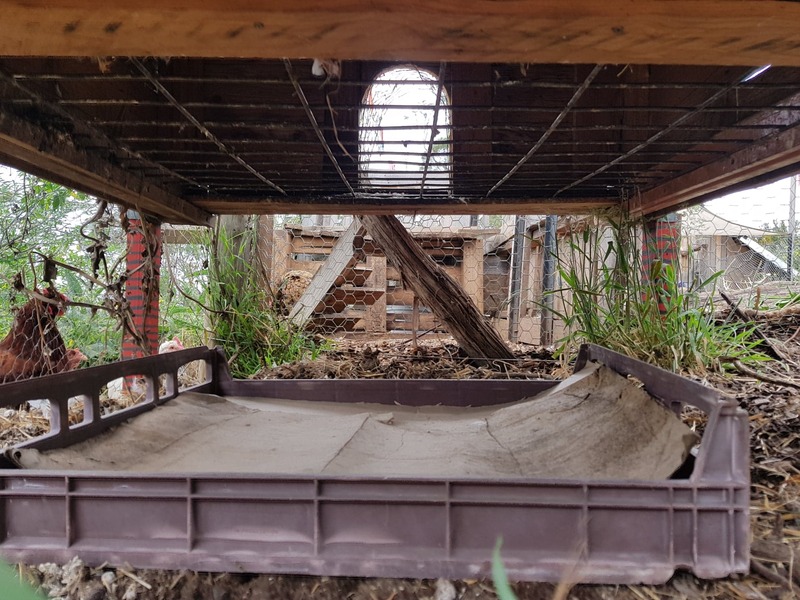 I then put the bread crate back under the house with a sheet of cardboard in it (to cover all holes) and wait for more poo. But surely that pile of poo smells under the house? No. There’s a significant amount of straw in there which prevents any smell from happening. It’s a nice blend of carbon (straw) and nitrogen (poo). Perfect. I only harvest poo from here every few months or so. Don’t the chooks get cold with that mesh floor? Chickens are hardy birds and we’ve found no negative impact on their health or egg laying, so I say no. Do they fall through the mesh? Chickens are originally jungle birds. This means they’ve evolved to sleep in trees on branches or within shrubs. Their feet are designed to curl around and hold onto different “roosts”, so this mesh floor is 100% fine for them to walk on. Saying that, this is on the larger side – usually we’d find mesh with smaller holes when building them for other people. But overall this is completely fine. 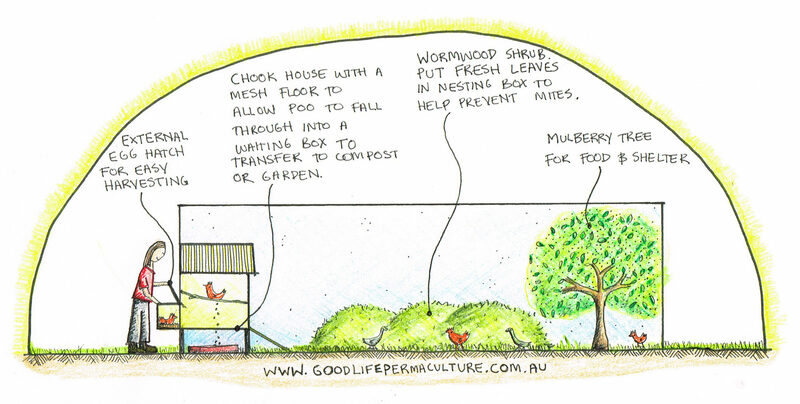 There you have it, go forth and create self-cleaning chook houses in peace and relief of never having to scrape poo off awkward spaces again. You’re welcome :-).